A really wonderful book on Leonora Carrington has just helped me fill in all sorts of blanks in my knowledge about this high-voltage Surrealist painter, who died earlier this year at the age of 94. The book, in Spanish, is simply entitled "Leonora", in the form of a novel, but clearly hewing very close to reality, because the authoress, Elena Poniatowska, knew Leonora well in Mexico City. A rebel from the very start, Leonora Carrington spent her privileged youth in Britain in a series of acts of defiance against her father, Harold Carrington, the then powerful and very wealthy head of Imperial Chemical Industries. She soon developed a very lively imagination and fascination with Celtic folklore, as well as a deep love of horses, a motif that appeared frequently in her paintings. Her love of art helped sweep her into a world where she met Max Ernst, the Dada and Surrealist German painter. Ernst influenced her way of painting, hardly surprising for they had a passionate love affair in Paris and the South of France until Ernst was arrested and interned after the Germans invaded France. Their circle of friends included most of the artists and celebrities of pre-World War II who spent time in Paris, from Picasso to Andre Breton, Dali, Paul Eluard and Miró . After Ernst was arrested, Leonora suffered a horrific nervous breakdown. She escaped to New York after so-called treatment for the breakdown at an expensive clinic in Spain, an escape from war-ravaged Europe that was only possible because she married Renato Leduc, working at that time in the Mexican Embassy. Peggy Guggenheim was also awaiting passage to New York and the whole group of Surrealist authors, artists and their entourage continued to see each other in New York, where Peggy Guggenheim helped secure exhibits for the Surrealists. Leonora painted but she also wrote a large number of books that garnered her a loyal following, especially after she moved with Leduc to Mexico City. There, she and Leduc separated and she married the Hungarian refugee Surrealist photographer, "Chiki" Weisz who had been the darkroom manager for his friend, the photographer Robert Capa. Leonora's life in Mexico City was enriched by friendships with other artists, such as Remedios Varo, as they explored Mexican folklore, pre-Columbian art, alchemy, Jungian and Freudian thinking, Gudjieff's writings – in wonderfully diverse intellectual questings. All these strands showed up in some form or another in Carrington's paintings, and she became one of the most celebrated artists in Mexico. The mythical worlds she created on canvas (and in sculptures) wove magical beings and animals together, literally (for she would turn cobras into goats or transform blind crows into trees) and metaphorically. 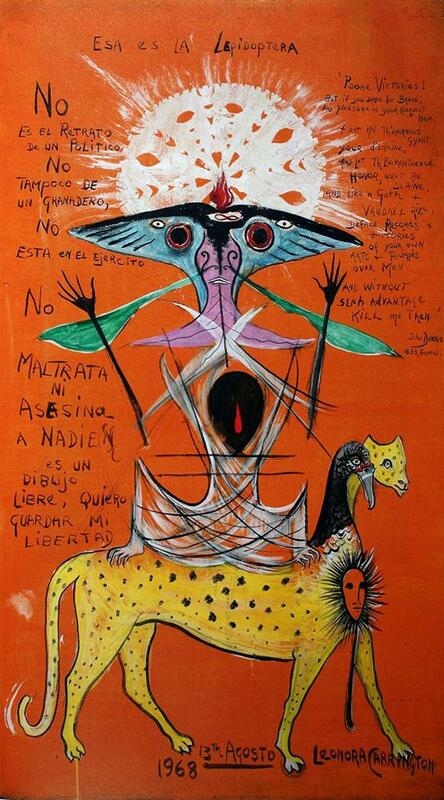 Leonora Carrington's life is an inspiration to us all as artists. She dared defy traditions and pre-conceptions. She drew on such diverse sources for inspiration, from childhood, from fairy stories and folk art, from religions. She was endlessly creative and inventive, in her writing, in her art and in her relationships with friends and acquaintances. When Elena Poniatowska's book, "Leonora", is translated into English, as it surely will be, I highly recommend it. It is a fascinating way to learn more about this remarkable Surrealist artist.